Young Guns is a series where we endeavour to find out more about some of the young professionals in the industry. Today we speak with Charlie King, bloodstock executive at Goffs UK. TDN: What was your path into the industry? CK: I was brought up on a stud farm and was thus exposed to life in the industry from a very young age. I witnessed foalings before I went to school and went racing on the holidays. To learn about the birds and the bees my parents sent me off to the covering shed. My father, Richard, was an eventer and ran his own business breaking in and preparing young horses for eventing, point to pointing and show jumping and now works as Kirsten Rausing’s broodmare manager. During my holidays I worked for Kevin MacAuliffe at Fernham Farm. After school I went to The National Stud to do the diploma course. TDN: Who has been the biggest influence on your career? CK: I have been lucky to have many people help me throughout my career. My father and mother first and foremost. My brother Tom is also incredibly knowledgeable of every area in the industry and his opinion is always hugely valued. It is great to have someone like him to bounce ideas off of. Outside of family, Brian O’Rourke was the manager of The National Stud when I did the diploma course and he was the reason I got the chance to go to Lane’s End in America, which kick started my career. Nicky and James Stafford of Thurloe Thoroughbreds have been a constant point of contact and have helped and supported me to develop my career. Lastly, I must mention Johnnie Peter-Hoblyn, who introduced me to Henry Beeby after I came back from a year spent in Australia, which brings me up to where I am today. TDN: What does your role involve? 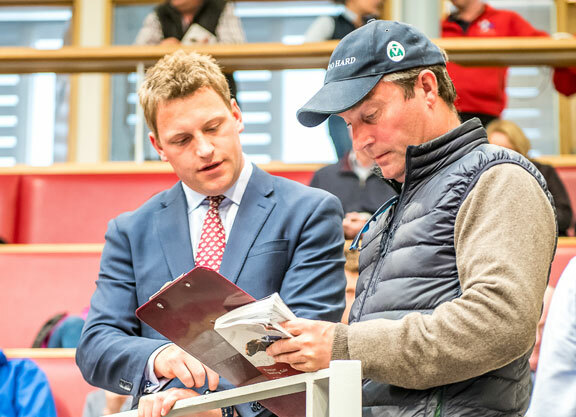 CK: I work in the bloodstock department at Goffs UK, at the sales in Goffs and form part of the inspection team focusing mainly on the vendors in the West Country of England. When I am in the office I am liaising closely with our vendors about their bloodstock for different sales throughout the year, sourcing entries, helping to promote upcoming sales and also helping with the preparation of our catalogues, the editing of pedigrees in particular. TDN: What challenges do you face in your role? CK: There are always a few challenges working for an auction house as we are working for everyone. But, in truth, Goffs has a fantastic team, not just in our offices, but also out in the field and around the world as we have a superb network of international agents. Everyone wants the very best for each vendor and each purchaser, whether you are at the top of the market or involved with just a single lot at the lower end of the market. I have seen first-hand the work which goes in to reach the very best standards, acting with the highest integrity, professionalism and good old-fashioned hard graft. TDN: What advice would you give your 16-year-old self? CK: Enjoy the journey, work hard, believe in yourself but don’t be afraid to ask for help, always do your very best in any given situation and lastly but most importantly, positive thoughts have a positive outcome, negative thoughts have a negative outcome. Stay positive. TDN: What do you think is the biggest challenge facing the industry and how would you solve it? CK: Lack of prizemoney, especially at the grass roots, and Brexit would be the two biggest challenges at the top of the list at this point in time, I would have thought. Prizemoney is a catalyst for other factors such as the current crisis of lack of employees on stud farms and in racing yards. Furthermore, there would be little disputing that if it was to increase it would have a direct correlation on an increase in ownership numbers. It would seem at the moment no one really knows what is happening with Brexit; once the picture is clearer I hope that our industry and government can work closely and coherently. Increase in foal crops is something which may become a challenge as well in the imminent future. TDN: What do you think horse racing’s perception is among the general public? CK: Attendance rate at race meetings and viewing figures on TV would suggest it is a popular pastime and of great interest to the general public. It is deemed to be a glamorous sport and I believe people love to get dressed up and go racing. It is fun and sociable but not fully understood by the general public on an occupational level. I also believe more work must be done to convince people that actually we have a very clean and transparent sport and that when horses don’t run to form it is because they are not machines and rather living and breathing animals with their own thoughts and ideas. Racehorses can also have ‘off days.’ Charities such as Greatwood and the Retraining of Racehorses are incredible and they should also have more exposure. TDN: How would you attract more young people into the workforce? CK: Going racing can potentially be an expensive afternoon. Racecourse admission could be as much as £35 for some racecourses and meetings on a Saturday. I believe this figure would have to come down to make a day at the races more viable for a lot of young people. If we were to get a larger volume of younger people going racing it would generate more interest in the sport. Off the back of this, it wouldn’t be out of the question to suggest that people may investigate following a career path into the industry. The industry, especially the breeding side, I believe can seem less accessible to what is reality. We have a fantastic product to showcase, a dream to most people, but it is a perfectly accessible dream which I believe the general public do not realize. TDN: Who is your favorite racehorse of all time and why? CK: Tricky one, there has been so many. Harry Angel came out of my first Premier Yearling Sale I did working at Goffs UK; to see Godolphin’s sprinter crowned 2017 Cartier Sprinter of the Year and then follow it up by being crowned the Longines World’s Best Sprinter of 2017 was quite remarkable. At Andrew Balding’s, Side Glance won the G1 Mackinnon S. He was a beautiful horse, very tough. Fame and Glory and Dragon Dancer are also notable favourites; they were foaled at home at Kirsten Rausing’s St. Simon Stud. Both horses went on to be second in the Epsom Derby, the former going on to win the Irish Derby and four other Group 1 races. TDN: Tell us something about yourself that not many people would know. CK: I love the saxophone and am very keen to learn. TDN: What would you like to achieve in the next 5 years? CK: The Goffs UK Breeze Up Sale has been phenomenal over the past couple of years. It has become the sale to go to if an owner wants a Royal Ascot runner. This year’s catalogue looks even stronger than previous years and we all at Goffs UK look forward to showcasing it around the world to prospective buyers. On a personal note, within five years, I would have liked to have started to learn to play the saxophone and speak French. Auctioneering is something I would like to focus on and get better at as well.